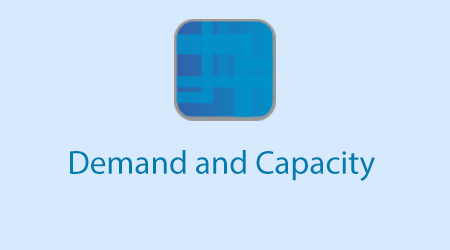 The Demand and Capacity e-learning programme supports NHS staff to better understand demand and plan sufficient capacity so that patients do not have an unnecessary wait for treatment. The e-learning programme has been developed by the National Demand and Capacity Team, jointly with NHS England, NHS Improvement and Health Education England e-Learning for Healthcare. The mismatch and variation between capacity and demand is one of the main reasons why waiting lists or ‘backlogs’ develop and waiting lists and waiting times increase. The undertaking and understanding of the outputs of robust demand and capacity modelling are a basic requirement for the planning and delivery of healthcare services in a modern health and social care system. This introductory course provides a knowledge base around these topics. If you already have an account with e-LfH, then you can enrol on to the Demand and Capacity programme by logging in to the e-LfH Hub, selecting My Account > Enrolment and selecting the programme. You can then access the programme immediately in the My e-Learning section. The Demand and Capacity programme is also available to NHS healthcare staff via the Electronic Staff Record (ESR). Accessing this e-Learning via ESR means that your completions will transfer with you throughout your NHS career.